the world is mine: bushoe! KABUL, Afghanistan – President George W. Bush wrapped up a whirlwind trip to two war zones Monday that in many ways was a victory lap without a clear victory. 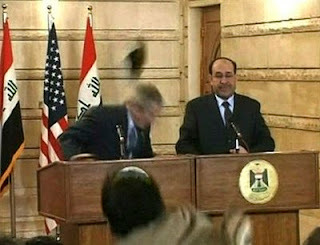 A signature event occurred when an Iraqi reporter hurled two shoes at Bush, declaring: "This is from the widows, the orphans and those who were killed in Iraq." The president visited the Iraqi capital just 37 days before he hands the war off to his successor, Barack Obama, who has pledged to end it. The president wanted to highlight a drop in violence and to celebrate a recent U.S.-Iraq security agreement, which calls for U.S. troops to withdraw from Iraq by the end of 2011. "The war is not over," Bush said, but "it is decisively on its way to being won." Bush then traveled to Afghanistan where he spoke to U.S. soldiers and Marines at a hangar on the tarmac at Bagram Air Base. The rally for over a thousand military personnel took place in the dark, cold pre-dawn hours. Bush was greeted by loud cheers from the troops. But the president's message on progress in the region was having trouble competing with the videotaped image of the angry Iraqi who hurled his shoes at Bush in a near-miss, shouting in Arabic, "This is your farewell kiss, you dog!" The reporter was later identified as Muntadar al-Zeidi, a correspondent for Al-Baghdadia television, an Iraqi-owned station based in Cairo, Egypt. Reaction in Iraq was swift but mixed, with some condemning the act and others applauding it. Television news stations throughout Iraq repeatedly showed footage of the incident, and newspapers carried headline stories. In Baghdad's Shiite slum of Sadr City, supporters of radical Shiite cleric Muqtada al-Sadr called for protests against President Bush and demanded the release of the reporter, who was jailed after throwing his shoes. Thousands took to the streets Monday, chanting, "Bush, Bush, listen well: Two shoes on your head." The Iraqi government condemned the act and demanded an on-air apology from Al-Baghdadia television, the Iraqi-owned station that employs Muntadar al-Zeidi. The reporter was taken into custody and reportedly was being held for questioning by Prime Minister Nouri al-Maliki's guards and is being tested for alcohol and drugs. "It harmed the reputation of Iraqi journalists and Iraqi journalism in general," according to a statement released by the government. Other Arab journalists and commentators, fed up with U.S. policy in the Middle East and Bush's decision to invade Iraq in 2003 to topple Saddam, echoed al-Zeidi's sentiments Monday. Abdel-Bari Atwan, editor of the influential London-based newspaper Al-Quds Al-Arabi, wrote on the newspaper's Web site that the incident was "a proper goodbye for a war criminal." Karzai's deputy spokesman, Saimak Herwai, told Afghan reporters that they had to address Bush as "His Excellency," an honorary title not typically used with U.S. presidents. The request was followed by some, not by others. Bush then took a helicopter ride to Kabul to meet with Karzai. After their meeting, Bush said he told Karzai: "You can count on the United States. Just like you've been able to count on this administration, you'll be able to count on the next administration as well."